Anxiety Disorders Made Simple illustrates the most prominent psychological treatment methods for therapists to use with anxious clients. 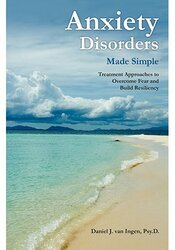 This book, rooted in current research, presents proven strategies to establish breakthroughs in anxiety treatment. Dr. van Ingen provides vivid, practical examples to empower people to build anxiety tolerance, gain freedom, and experience resiliency as they confront their fears. DANIEL J VAN INGEN, PSY.D. Daniel van Ingen, Psy.D., is passionate about the treatment of anxiety and believes that his strategy of anxiety tolerance training requires non-medication treatment strategies. He has developed easy-to-understand explanations and techniques that quickly fuel the road to recovery. A licensed clinical psychologist in Florida, Dr. van Ingen maintains a private practice that specializes in anxiety treatment called Anxiety Shrinks! Prior to private practice, he worked at a VA hospital, colleges, a drug treatment program, and outpatient clinics. Dr. van Ingen, trained as a scholar-practitioner, has many empirical studies published on cognitive behavioral therapy for anxiety disorders, parenting research, and disabilities. He has presented at national and international conferences for over 15 years and has trained providers in 30 states over 5 years. His book, Anxiety Disorders Made Simple: Treatment Approaches to Overcoming Fear and Building Resiliency, (PESI, 2014), has received outstanding reviews from psychologists, psychiatrists, and social workers alike. He has been dubbed the Sarasota Parenting Doctor in his private practice work with families. Dr. van Ingen blogs anxiety articles and posts weekly parenting podcasts on his “Parenting Doctors Podcast” on iTunes.